Mere moments after President Donald Trump announced Neil Gorsuch as his nominee to succeed Antonin Scalia on the United States Supreme Court, Democrats began rallying to filibuster the nomination. House Democratic Leader Nancy Pelosi called Trump's nominee "a very hostile appointment" and "a very bad decision, well outside the mainstream of American legal thought" during her interview on CNN shortly after the announcement. Sherrod Brown was the first senator to announce opposition to Gorsuch in a statement in which Ohio senator said he couldn't "support any nominee who doesn't recognize corporations are not people." Supreme Court nominee Judge Gorsuch firmly stands as a strict constructionist, fitting the mold of the late Justice Antonin Scalia. Judge Gorsuch is eminently qualified to serve on the #SCOTUS. @POTUS should be commended. Look forward to a fair Senate process. Trump is about to announce his pick for a Supreme Court Judge, but it looks a lot more like what you and I went through on @nbc @clayaiken! Senator Bernie Sanders tweeted his apprehension over the nomination on Tuesday shorter after the prime-time announcement, as protests had already begun on the steps of the Supreme Court in Washington D.C. "Judge Gorsuch must explain his hostility to women's rights, support of corporations over workers and opposition to campaign finance reform," said Sanders. "I am troubled by the nomination of Judge Gorsuch and will fight to ensure the voice of the American people is heard in this process," said California Senator Kamala Harris. "The next justice will have a profound impact on money in politics, voting rights, immigrant and women's rights, and more." 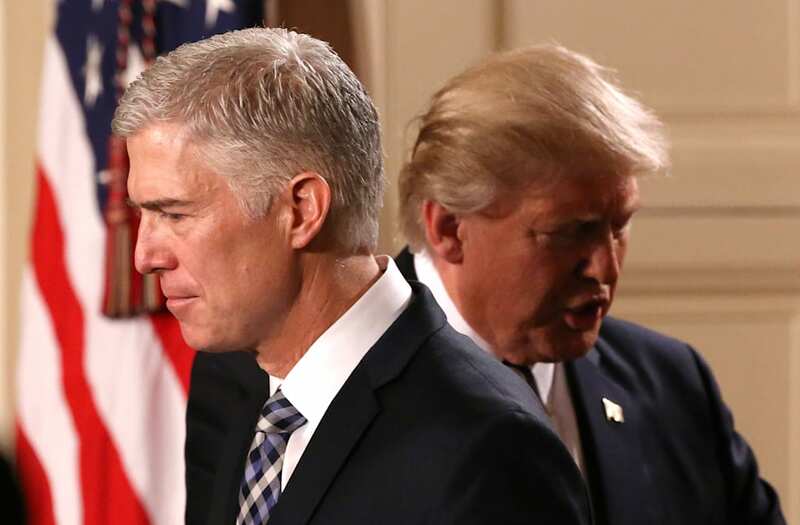 Many Republicans, including Trump, championed Gorsuch as an ideal candidate, and pointed to his unopposed appointment to the Tenth Circuit Court of Appeals as a reason to swiftly approve his nomination this year. But opponents on the left suggested that the GOP Senate leadership's decision to block Obama nominee Merrick Garland has set the stage for a bigger battle over Gorsuch. Former President Obama nominated Garland in March 2016, a month after Scalia's passing. Senate Republicans refused to hold a hearing or vote on his nomination during Obama's last year in office. Tom Perez, former United States Secretary of Labor, explicitly called for Senate Democrats to take action against Trump's first Supreme Court nomination. "Simply put, a Justice Gorsuch on the Supreme Court is intolerable and it's up to Democrats to block his nomination," said Perez reportedly. Democratic super-PAC American Bridge is set to release a mound of opposition research on Gorsuch. According to The Hill the 78-page booklet slams Gorsuch as, "too extreme for the Supreme Court." However, some on the left are not as eager to draw this particular line in the sand. Former Solicitor General Neal Katyal, who worked under President Obama, wrote in the New York Times that "If the Senate is to confirm anyone, Judge Gorsuch ... should be at the top of the list." At least one lawmaker on the left remained committed to seeing the nominee pass. Senator Joe Manchin said he will not join calls from fellow Democrats to filibuster Trump's Supreme Court nominee. "I'm not going to filibuster anybody," Manchin said.